Banana is nutritious, delicious, wholesome and a caloric dense fruit. It is cheap and available throughout the year. When you compare it with an apple, it has much more protein, carbohydrate, phosphorus, vitamin A, iron, and other vitamins and minerals. It is also rich in potassium. Consumption of banana gives the feeling of fullness and makes one feel energetic. This fruit is much beneficial for athletics and fitness activities because it replenishes necessary carbohydrate, glycogen and body fluids burned during strenuous physical activities. Banana can be eaten in its whole form, sliced into fruits salad or blended in a smoothie or mashes and added to muffin and bread recipes. Banana is beneficial not only to keep you fit but it also helps to overcome and prevent many health conditions. 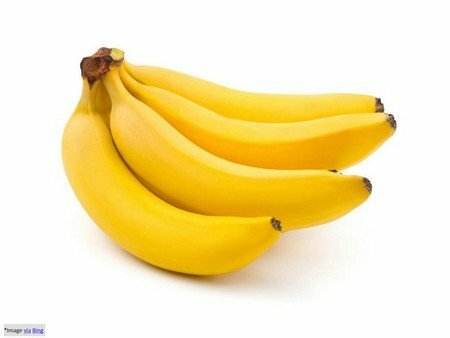 Blood Pressure: Banana is a good source of magnesium and extremely high in potassium yet low in salt which aids in maintaining normal blood pressure.US FDA Has allowed the banana industry to make an official claim for the fruits ability to reduce the risk of blood pressure and stroke. Bone Health: High intake of sodium can cause an excessive amount of loss of calcium through the urine which threatens the strength and general health of the bones. Potassium present in the banana neutralizes the negative effect of high sodium in one’s diet, thus allowing calcium to remain within the body and prevent the weakening of bones. Stomach Ulcers: Bananas have an antacid effect and are used as the dietary food against intestinal disorders because of its soft texture and smoothness. Bananas are known to stimulate cell proliferation which thickens the stomach mucosa and due to its antacid effect neutralize over-acidity and reduce irritation by coating the lining of the stomach. Constipation: Bananas are high in soluble fiber and assists in healthy digestion. Including banana in the diet helps restore normal bowel action and eases out constipation problem without resorting to laxatives. Quit Smoking: Banana contains B6, B12 as well as potassium and magnesium that helps the body to recover from the effects of nicotine withdrawal and thus it can help people trying to give up smoking. Depression: It has been found that people suffering from depression may feel much better after eating the banana as it improves mood and makes you feel happier and relaxed. Mosquito Bite: Rubbing the inside skin of banana at affected area reduces the itching, swelling, and irritation that is normally associated with mosquito bites. Brain Power: Potassium packed fruits like banana help in boosting brain power. Anemia: Banana helps in cases of anemia by stimulating the production of hemoglobin in the blood being rich in iron also. Hangovers: Natural ingredients in banana replenish the body’s vitamins and reduce the effects of a hangover. Banana milkshake sweetened with honey or blending banana with some plain yogurt and adding some honey is the quickest way to cure the hangover. The banana calms the stomach and honey helps to restore the blood sugar levels to normal while the milk soothes and re-hydrates your system. Pregnant women: Pregnant women often eat bananas due to its calming properties, to combat their morning sickness. Banana replenishes the body and restores healthy sugar level and also helps to regulate pregnant women’s temperature. Menstrual cramps: Vitamin B6 in banana regulates blood glucose levels and relieves menstrual cramp. 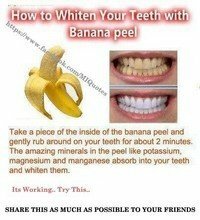 Teeth Whitening: Rub the skin of inside skin of banana peel around on your teeth for two minutes. Amazing minerals like potassium, magnesium, and manganese absorb into your teeth and whiten them. Warts: Outside skin of banana peel also has healing and beneficial properties for the human body. Take a piece of banana skin and wrap the outer skin on the wart. To keep the banana skin on wart wraps a tape around it. The outer skin of the peel will rub against the wart and will kill it. With all these health benefits, banana is such a popular fruit and is more beneficial than other fruits. Banana is really a natural remedy for many health conditions.